All stamps need a little attention from time to time and while we do our part to present you with the very best quality stamps that we can manage, the day will come when your impression is no longer as clear. But fret not! When this day finally arrives, all you’ll need to do is pick up one of our brand specific ink pads to get it looking as good as new! Learning how to refill your self-inking stamp is easy. 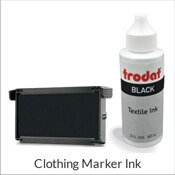 When it's time to replace the ink pad in your self-inking rubber stamp, we're the resource for you. 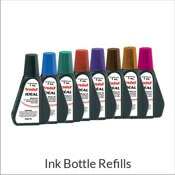 We offer replacement ink pads for a variety of stampers from several vendors. Whether you need ink refills for your custom logo stamp, return address stamp or other personalized self-inking stamp, we have options. Search for the Trodat, Ideal, of Max model you own here. 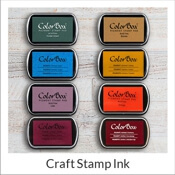 Find craft stamp ink pads in multiple colors and sizes as well. 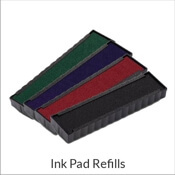 Many ink pads are available in Blue, Red, Green, Pink, Purple, Orange, Brown, and Black. Order the right one for you today.